With the rise of voice search, hyper-local targeting and on-the-move search capabilities, voice search is a rapidly growing form of search queries, which sites need to optimise for (or face falling behind). Much like AMP for news sites and Publishers, voice search is the next step for authority sites and niche content platforms alike looking to capitalise on user queries and conversational search terms. From Google Home and Amazon Echo to Siri and Cortana, voice search has never been a more accessible and rapid alternative to manual searches. So why should website owners start to optimise for voice search queries? Let’s take Google Home for a tried and tested example. When answering a question to a conversation voice query, Google Home will first read the website address (such as ‘according to 123.xyz’) before reading out the entire featured snippet displaying for that result. 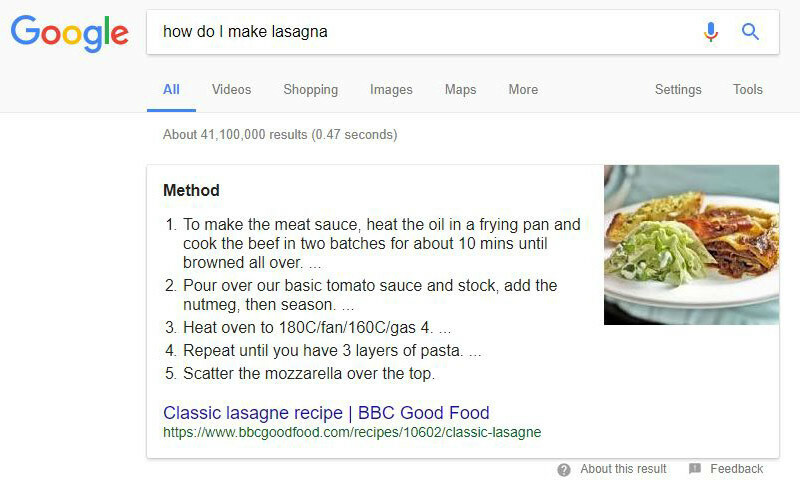 With nearly 30% of search results now displaying featured snippet results, it is crucial that sites are optimised effectively for this growing SERP phenomenon. If all bases are covered, a site inevitably starts to become an authority in its category for voice search, and therefore an authority in the eyes of the voice searchers too. With this in mind, let’s look at how you can optimise your site for voice search using targeted featured snippet results and structured data markup. Optimising for featured snippets is primarily achieved by structuring content in a way that is readable for both visitors and search engines, splitting up content into paragraphs and easily digestible chunks. By targeting ‘what’, ‘where’ and ‘why (conversational keywords) via a content hub or blog section, you can begin to target questions likely to be asked specifically to voice search devices. It is also imperative that the content you want to display in a featured snippet is easy to find on your page. This could be in the form of quotes, italics, bold or a numbered/bullet point list. In doing so, search engines (and users) can clearly identify the part of the page that they came for. Optimising for featured snippets ultimately comes down to quality design practices, and creating content that you would want your site to rank for too. With voice search not going away, now is a great time to consider what voice search queries your audience might be using, and how you can utilise a content hub or content strategy to dominate those featured snippet results.